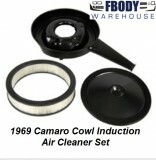 High above the block of your “mouse” or “rat” you will find the air cleaner system. Be it stock or custom this is the FIRST thing you see when the hood comes up and you can make it the best! Fbodywarehouse offers a wide variety of products to make your first generation Camaro and Firebird look and breath like new! 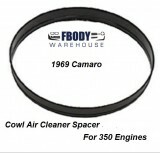 1967 - 1974 Camaro Firebird Trans Am Air Cleaner Element Air Filter 14 Inch Ram Air Cowl Induction style.